More soon, but a quick post at the very end of the day about how things are looking here in Cancun. Today started out leisurely, we were on the shuttle to Cancun Messe around noon and got there in the early afternoon. The roadways are lined with police in a number of forms, but most foreboding is the Federal Police with their large automatic weapons. There is less of a mass outside this initial meting place than the Bella Center, and it is just a stop over to most of the other sessions at the Moon Palace resort. Both locations are remote. The only reasonable transportation is the semi-hourly shuttles for various spots in the surrounding area. With no lack of trying to be helpful, a staffer directing buses attempted to put us closer to the small town, where we could pick up the shuttle to this year’s Klimaforum. It instead put us at an equally remote resort from which we took a cab. Originally we were going to take the taxi from the resort to the shuttle stop, but I opted in for the full ride. We arrived at the Kilmaforum hopeful, it was fairly well signed up to the gate, but once in it was a slow downhill. We traveled into the back of the El Rey Polo Club and found a hand drawn “Registro aquí”. The table to which it referred was staffer by temporary relief for the women who had been there. They assumed we would want to camp there, but we just were there to visit. We were also informed the shuttle wasn’t running on any schedule, just when people want to go and there was critical mass (10 people). We asked about getting the shuttle from the shuttle stops to here, they were puzzled. Whereas the Klimaforum in Copenhagen for COP15 was the conference for everyone else that wasn’t in the Bella Center, this did not follow in it’s footsteps. Closer to the Climate Bottom Meeting in Christianshavn, even with tents for meeting spaces, it was more of a temporary commune than a conference. They had faster Wireless than our hotel, but were otherwise unprepared for visitors. We were directed to a press person who didn’t speak english, which is fine, it’s Mexico, where spanish is spoken, but we had made it clear to someone from an english speaking country (USA or Canada) that our spanish was minimal. So we hung out waiting for some film we were told was going to be shown at 5:00pm, then 5:30pm, but it never happened. After a guy who had hitchhiked from the Netherlands came to talk to us, since we’re press, we tried to leave. We asked about the shuttle and were told, that it’s only $1o pesos/person if there were 10 people in the shuttle, since that’s how much it costs to make the run. Since it was just us 2, it would be $50 pesos/person… just to leave we did it. The most comfortingly reliable and convenient transport of the day was the bus we took back to cancun. If you say the conference is from the 26th of a month, but don’t intend to have public until the 29th, just say it starts on the 29th. If you tell someone that you’re going to show a film at 5pm, show a film at 5pm or make an announcement. If you say you’re open and you’re running a shuttle, run the shuttle and put it where people, thinking you’ve started, will expect to find it. Also 2 shuttle vans for 10 people each running each journey for what you think is going to be even just hundreds of people is not enough. Be upfront about how your systems work, and commit to it, even if it’s not going to be the best thing in one particular way. If you’re going to do the communal living, camping in the woods, contemporary hippie thing… please be aware that it isn’t the most inclusive way to do things. You may be all friendly and want to love everyone warmly, but not everyone is bought into an extreme lifestyle like that, but they still might care about the climate. We made it back to our hotel, even more so an oasis after the frustrations of the day, and set about dinner. We wandered nearby to the central square, which reminded me of home around area like Echo Park and McArthur Park. We had some food and wandered to the UNESCO photo exhibit on disappearing climates. Not unlike some of the photo exhibits in the public squares of Copenhagen. It was the first real, accessible, publicly engaged moment of the day. Tomorrow should prove to be better, I’m spending the day at the Villa de Cambio Climático, while Moe heads to the opening plenary. HOpefully more to report tomorrow, when the real fun begins! My December 18, 2009 press conference in the Jasger Jorn room at the Bella Center for the fifteenth Conference of the Parties (COP15) was scheduled the same day President Obama was scheduled to arrive in Copenhagen. The same week that press conference was scheduled, outside Bella, at the invitation of Oleg Koefoed of Cultura 21 Nordic, I was scheduled to conduct a three-day workshop on the theoretical basis of my ecological art work. 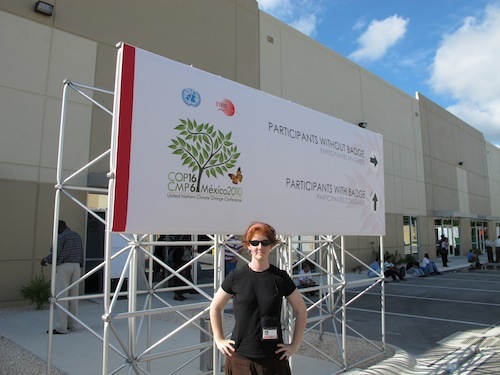 I was attending COP15 as as an official observer and part of the University of Colorado (UC) Non-Governmental Organization (NGO). What I would see as an observer, was an effort on the part of many, to help make sense of and advance progress on a problem shared by the whole world, regardless of what policy makers would say in plenaries. I was moved to notice that easily 50% of participants were under thirty. But I saw an equivalent push-back from those determined to cast a blind eye on history, for their own short-term comfort and advantage. What I experienced as an artist was neither light-hearted nor simple. But it was a lesson about what can happen when enough people converge on the same problem. The groups I was working, in touch, exchanging information with and learning about, from December 6-19, are too numerous to count. In addition to the UC group, Cultura 21 and Cultura 21 Nordic, they included Avaaz, the Yes Men, representatives from the World Bank, Island Nations, heads of American agencies, Greenpeace, 350.org, gallerists from Khoj International, New Delhi, India, ARTPORT and Poulsen in Copenhagen, High Tide (for whom I blogged), the Climate Forum, the Climate Pirates, Culture Futures, the eco-art dialog, World Wildlife Fund International, European Union negotiators, the Center for Sustainable Practice in the Arts and the Danish police. 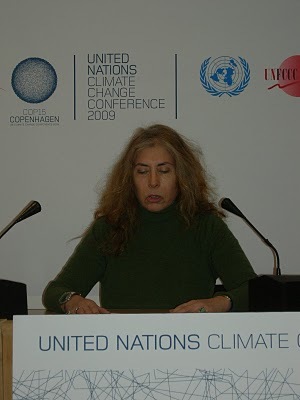 The press conference was subsequently re-scheduled three times, as I worked with the United Nations press office to negotiate around the growing panic of conference organizers and police in the face of a perceived degeneration of civil control towards the end of COP15. The press conference I planned to deliver would have challenged policy makers to include language about art-making in their adaptation policies for climate change. It would have given an example from my collaborative work with scientists. COP documents speak of the need to address the “aspirational goals” and support the “resilience” of vulnerable nations confronting the stress of adaptation to climate change. But they go on to define those goals strictly economically. As others pointed out, you can’t address “aspirations” or resilience solely economically. Art is the glue holding societies and cultures together, particularly when they are under stress. In Copenhagen, the press conference became the art and it was a collaborative, intuitive production. My experiences in Copenhagen were fraught with paradoxes. It was terrifying for what wasn’t accomplished at the conference. It was inspiring for what I learned about work being done to mitigate climate change all over the world. Horizontal connections were made between disparate groups and individuals spontaneously connecting as equals at events that ranged from the formal reception and diplomatic plenaries of COP15 to the Climate Pirates who sailed into port from Germany and the vast demonstrations in Christiana. It was frustrating because my COP press conference never happened. Everything that happened in Copenhagen was staged for layers of media and an international audience. In that sense, the critical days, from December 7 to December 18, were one continuous, anarchistic media event, with no single individual, group or nation consistently taking center stage. Ultimately, the whole world became the venue for a giant teach-in, in the form of the largest Happening ever. It was attended by millions around the world, some of whom were reporters, all of whom had a stake in our outcome. 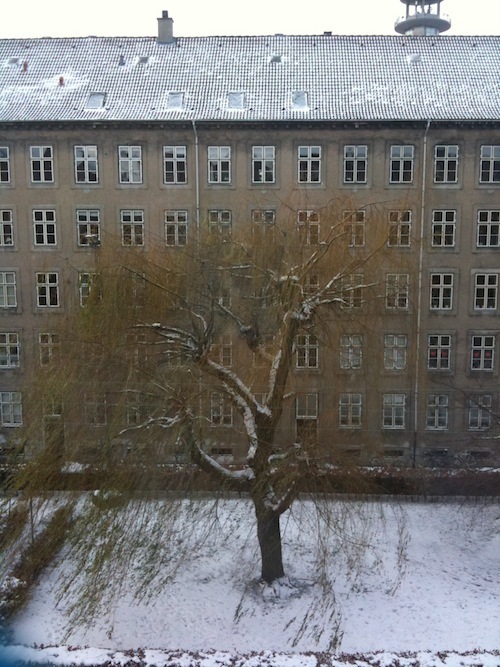 Copenhagen was the site of multiple realities about global warming. Many of us simultaneously participated in a wide range of activities with the broad assembly of groups in attendance. In addition to blogging, I went to and participated in sessions at the Bella Center; helped work on the press conference for the Collaborative Program on the Ethical Dimensions of Climate Change (EDCC ); showed up for various art openings and shows in the city, indoors and outdoors; participated in demonstrations; exhibited my own films; helped set up other people’s installations; attended several other conferences; hosted a workshop; networked at the COP reception; had dinner in restaurants with various groups, where other attendees were also dining and visited a few tourist sites, where ordinary Danes asked me about the conference while others staged elaborate art works to draw attention to global warming. 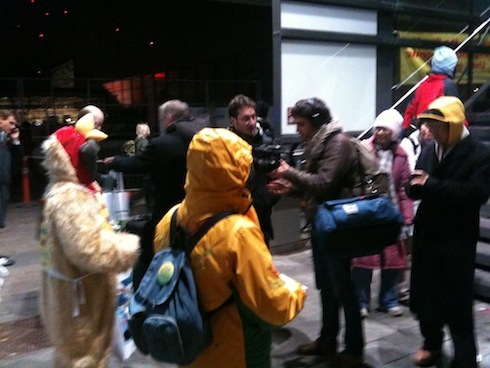 The media were all over the Bella Center during COP15. Island nations, as Tuvalu, Kiribati and the Maldives took center stage the longest, as eloquent spokespeople for what needed to be done and why. The press ran with their passionate stories. At every turn in Bella, through the halls and before plenaries, colorful demonstrations were attended by masses of flashing cameras of every size and type. The extent to which sophisticated performance art has saturated activism and how funny many were was striking. The “Fossil Awards,” gave out awards to the country that had most obstructed progress that day, with great pomp and ceremony, every evening at 6: PM to hundreds of cheering, jeering and singing COP participants. Outside Bella, in the streets of Copenhagen, was an installation about immigration (of climate refugees) mounted by Sacha Kagan on the basis of a work by students at the CCC Programme of the Geneva University of Art and Design. It included credible yellow wet-signs with the text “Caution Border”, police tape marking off parts of the street, printed with the slogan, “This is not a natural border” and slick black and yellow hand-out cards printed with provocative questions about borders. At demonstrations, the press caught glimpses of innumerable notable activists from every corner of the earth, from Wengari Maathi to Vandana Shiva. But the media also witnessed events turn violent at the hands of the Danish police. Back inside Bella, at official Side Events, reporters took notes and shot pictures of government ministers speaking to crowded rooms, sometimes to the extent that many of us were sitting on the floor. In the Jasger Jorn room at Bella, press conferences filled out informational gaps in the Side Events held in other rooms. After much internal conflict, I had flown to Europe for COP15, despite a previous vow in 2006, after Katrina, to reduce my carbon footprint by eschewing flight. The press conference I planned would have been an opportunity to present my work with Dr. Jim White, of the Institute for Arctic and Alpine Research, UC Boulder as a model for how we need to look at problems arising out of global warming, using virtual communications. The work with Dr. White has been premised on a series of experimental research projects applying Trigger Point Theory Theory as Aesthetic Activism to problems caused by global warming. We conducted our work in desktop sharing conversations, including other scientists and artists. The press conference would have included a presentation of our work, SOS Gulf to Gulf, comparing the impact of global warming on gulf systems internationally. It connects problems with Somali pirates, Katrina, education in Bangladesh, dead zones in the Gulf of Mexico and lobster migrations in the Gulf of Maine. Trigger Point Theory is a way to look at situations and see where to apply the least pressure to effect the most change. Flying to Copenhagen, working virtually, doing a press conference in Bella, were ways I was applying that principle. My ideas developed, out of my collaborative ecological art practice, from monitoring change at the sites of two environmental restoration projects I initiated and other related experiences. Trigger Point Theory Theory as Aesthetic Activism, evolved as a strategy to analyze causes of ecological degradation and create environmental restoration plans out of that analysis. It is presently my dissertation topic at Z_node, Institute for Cultural Studies, Zurich University of the Arts, (ZHDK) Zürich, Switzerland and the School of Technology, Communication and Electronics at the University of Plymouth England. Trigger Point Theory works by diagnosing a very small “patch” (in the language of landscape ecology), in a degraded system, comparable to identifying an acupuncture trigger point on the body of the earth, in a greater degraded ecosystem, whose restoration could catalyze regional healing for a larger landscape. Acupuncture identifies tiny points in systemic meridians of energy flow. Comparably, many indigenous rituals also seek to harmonize human needs with a whole ecology approach to sustainability. Diagnosing and identifying that process is the heart of my theoretical work. The Trigger Point Theory Theory as Aesthetic Activism workshop was held in the Global Room at Verdenskulturcentret, in Copenhagen. The workshop brought together a number of people concerned with global warming, involved in events that month. The participants represented a spectrum of interests from those engaged in the most radical demonstrations to simply concerned citizens. The workshop was organized around applying Trigger Point theory to our various activist concerns with free-hand mapmaking. I presented approximately twelve premises to observe situations for possible “Trigger Points.” As, how to identify where many factors come together, creating ecological edges that enhance each other and the importance of establishing buffer zones to insure resilience. The last day of the workshop was scheduled the morning of the second scheduled date for my press conference: Wednesday December 16. It was rescheduled when word spread that NGOs would be issued secondary passes to enter Bella towards the end of the last week of sessions. COP treaty negotiations need input from artists because art conveys the “aspirational goals (COP15 treaty language)” of culture. Culture is what contains civilized behavior despite chaotic transitions. Much of the plenary discussion framework was about the crisis of adaptation to the effects of global warming. Yet there was no mention of art’s role in cultural sustainability. That afternoon, violence against the demonstrators on the part of police, closed down Bella to anyone who hadn’t already entered that morning. I went there anyway. After much discussion, the police allowed me to hand 500 press releases for distribution through the fence gaps erected around the building to Marilyn Averill, the UC’s NGO co-ordinator, who was already inside. After the Wednesday closure and cancellation, at Bella, we rescheduled the press conference again, back to Friday morning. No one knew what would happen next, especially about climate change. By Friday, access to Bella was restricted to 93 passes for 45,000 registrants, effectively locking me out of the building and closing my door to Jasger Jorn and the webcams there. Instead, the Friday before I left, I recorded the press release I’d prepared for COP15, at the Poulsen Gallery, for the Yes Men and Avaaz. The Yes Men and Avaaz had set up a fake Bella Center (Good COP15 http://www.good-cop15.org shadow Bella Center). They taped a number of presentations, some of which have been mounted on the website. The tapes illustrate that everyone has aspirations in relation to global warming. Most are light-hearted, often humorous general proclamations and wishful statements about the world we need. What was ultimately seen by the world beyond Copenhagen didn’t just come from Jasger Jorn, the Poulsen Gallery or the streets. It also came from hundreds of blogs (including my own http://high-tide-cop15.blogspot.com/) and a thousand candle light vigils around the world, many initiated by 350.org, the group started by Bill McKibben. Arguably, 350.org was the most effective group because their message about carbon particle reduction was so simple. The experiences of developed countries are particularly mediated through media. Media can be another venue for visibility or a portal for an audience to go to another site, another world. The denouement of COP15, challenged us all, arguably especially artists, to give some hard inspired thought to how we can help the media show people some new doors to open. What I might have had to say or what anyone else had to say, is part of an immense jig saw puzzle. It may adequately address global warming if we can just wrap our brains around how to perform a really effective horizontal press conference. “When we take “aspirational goals” seriously for the Least Developed Countries (LDC), we see that the arts in each culture and between cultures are a means to express aspirations, sustain it’s people, bridge communication gaps and be a container for important historical information, including indigenous environmental knowledge. 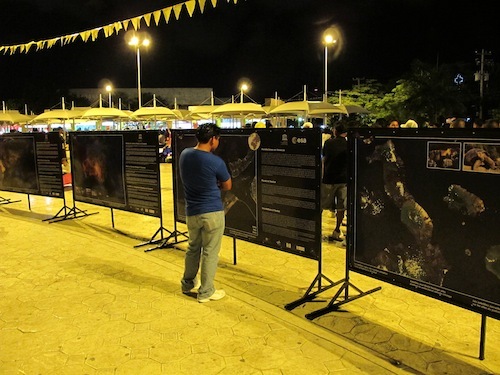 Art is a means to intimately connect people.” – excerpt from my SOS Gulf to Gulf press release prepared for COP15. The international experiences we’re having now because of unchecked global warming terrify any sane person. Global warming can be also be connected to terrorism. The consequences of rising carbon emissions include massive migrations of culturally disrupted climate refugees, for whom terror and rage are appropriate responses. The fact that many of these disrupted cultures have a history of sexism, privileging violent machismo in response to crisis and excluding women from full socio-political participation, contributes to chaotic behavior. Contemporary art that confronts this complex reality is an intensely intimate expression of connection between people, binding the aspirational goals of all life. In Islamic Jihadist rehabilitation, the creative act of “making” is considered a healing option to violence. The meaning of doing a press conference as an activist performance in Copenhagen (COP15) for me, hinged on defining an artist’s relationship to policy. My intention for the press conference had been to provide context for and an alternative model from which to negotiate. The first week at COP15, when I met and briefly worked with EDCC, I paid close attention to how they framed the need for accountability in the treaty policy language and made the decision to follow their example. One of the discussions that stuck most firmly in my mind centered on the relationship to press as partners in public education. I realized from that in addition to presenting a new model I had to explain a new definition of art. 1. Gender issues relate to questions of art and culture. Disproportionately, artisans in indigenous cultures are often women. Their practices often preserve the, “[land use, land-use change and forestry sector]”; (and represent how to) p. 92 “respect the knowledge and rights of indigenous peoples [, including their free, prior and informed consent,] Deforestation is often a consequence of the cultural disruption that displaces gender roles. 2. Art and humanities foster creativity through out all sectors of society. In transition periods, creative problem-solving is as essential to survival as financial or regulatory support. Early 2007, Marda Kirn put Dr. Jim White and I together to develop a collaborative project for the “Weather Report” show on global warming, curated by Lucy Lippard for the Boulder Museum of Contemporary Art. White and I began work with a passionate commitment to explore how to address global warming. Our work together further radicalized us about the urgency of associated problems, particularly migrations. A few months later, the idea to attend COP15 and hold a press conference there began gestating at a party after the opening. A number of us were sitting around a kitchen table, including Subankhar Bannerjee, Mary Miss, Lillian Ball and Marda Kirn, talking about art’s role in public policy. I suggested we hold a joint press conference in Washington, D.C., to present our ideas. Over the next few months, we tried to organize something. But the logistics daunted us and the plan went on my back burner for a year. Late 2008, Jim and I began working together again and the same questions about migrations arose. It was then that I said I wanted us to go to Copenhagen (COP15). Dr. White couldn’t go but by August 2009, I had my official status to attend. Simultaneously, Oleg Koefoed, whom had organized the Culture Futures conference the first week of COP15 in Copenhagen, invited me to lead the Trigger Point Theory as Aesthetic Activism workshop. Many of us who came to Copenhagen are still making sense of what happened there, what was accomplished, how we all connected and where we might go from here, from islands to artists. Post COP15, the larger degraded landscape to restore, has emerged as the “aspirational goals” of this planet. It still needs mapping. But one thing is clear, change will come, if it comes at all, from horizontal coalitions in civil society, taking the messages we all heard in Copenhagen and beyond, from press conferences to policy people to the world. Artists are poised to take a great part in that adventure. The second edition of the CSPA Quarterly is close to publication! It will be available by the end of the month. The second issue focuses on international eco-policy; policy’s effect on the arts, and arts’ effect on policy. Events and installations from COP15 will be featured, including the CO2 Cube, the Seven Meters installations leading to the Bella Center, and others. In celebration of the new year, we’ll be publishing last quarter’s articles to the blog. Keep your eye out for articles written by Sam Goldblatt, Moe Beitiks, Linda Weintraub, Patricia Watts, Thomas Rhodes, and Olivia Campbell. Thanksgiving long past, and holiday feasts ahead, but I’m already stuffed, thank you, with this years’ steady eco-art diet of Land Art adventures and COP15 coverage. It’s hard not to feel overwhelmed with art-nerd-glee. There is such a thing as an information coma, I swear. The art-and-landscape dishes started churning out of the Nevada Museum of Art kitchen with its LAND/ART symposium way back in June: that event kicked off a summer-into-fall series of lectures, performances, exhibits and tours that made NMA the best excuse to want to go to Nevada since Burning Man. Later in the year Land Arts of the American West, a field program directed by Chris Taylor, took some lucky followers on a tour of renowned site-specific installations and Land Artworks. Unfortunately, some of us had to stay at home with our Winnebagos, experiencing most of the glory over the internet. This month, while the delegates at COP15 tried to negotiate our way into a non-binding middle ground, Ian Garrett and William Shaw told us what artists were doing to mitigate the damage. There’s great coverage of actions, protests and memes by Shaw on the RSA blog– Garrett did comprehensive exhibition coverage and interviews for CSPA. It seems the artworks that struck the most resonant chord were also political actions: New Life Copenhagen, The Yes Men’s fake press release, actions that addressed COP15’s inaccessibility and ineffectiveness. Comedian Eugene Mirman voiced a couple of unanswered questions. The philosophical culmination is GOOD COP, an alternative Bella Center installed at Gallery Poulsen Contemporary Fine Arts in Copenhagen, where everyone from Daryl Hannah to Bill McKibben got some time on the mic to make their international declarations. If the dialogue keeps running this fierce, I’m not worried. That is to say: Burp. INTERVIEW: Ian Garrett Reports on COP15 and the Arts | Inhabitat. INHABITAT: What were your cultural expectations for Copenhagen? GARRETT: At this point, I don’t know what my expectations are. I’m a big fan of the idea that if you get a lot of people together in one spot, talking about a thing, things can happen. The feeling I have from the news out of here and being in the streets is that there is going to be more civilian change out of this than there will be government change. My hope is that, with this many people of divergent origins, with the efforts being made from a cultural end, that it will reify something at the grassroots level. I can only hope that it makes it upwards, because that doesn’t seem like the case at the Bella Center. INHABITAT: What have been some standout experiences thus far? What artworks have struck a chord, and why? GARRETT: It’s hard to tell right now, there is so much more to see in this next week, but if I chose now my vote is in for wooloo.org’s efforts and partnerships. They’ve got Superflex’s sustainable burial contracts, the Yes Men’s Coca-Cola Pledge and New Life Copenhagen. Everything they are doing is very much in the spirit of unity and many people doing small things towards a bigger goal. I think that’s a message in and of itself. And since all three of the projects I mentioned rely on documentation and masses of people as the documenters I think that it’s got the potential to show the most real human aspects of the issues being discussed and the opportunities to work together. There is the common thread these days of “Changing light bulbs won’t save the world.” Which is true, but you know, ultimately if everyone change all light bulbs, sure it would do something about energy use. The point being that lots of people making small efforts aren’t to be scoffed at. It’s those sort of efforts, that when combined, lead to tipping points. We just aren’t there yet, and light bulbs have no future as a tipping point for the climate. It is now the morning of the final day of COP15. Obama is in town. We are, of course, meeting for coffee. Regardless of our Head of State, it’s been a very busy and exciting few days since the last marathon check-in. 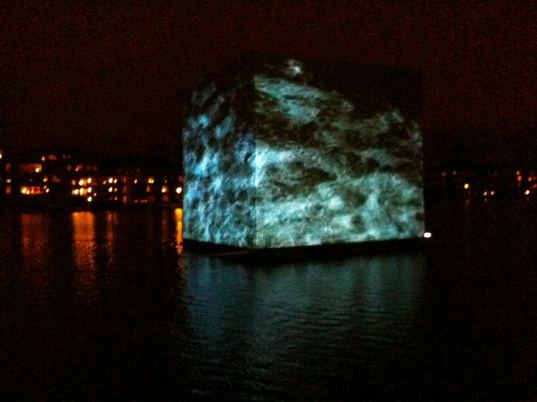 Hopefully you’ve been following as we highlight the arts happening around Copenhagen as they respond to COP15. I also hope you’ve been following the progress of the demonstrations around Copenhagen and the extreme tension that has built up between those inside the Bella Center and those forceful kept out. As we left it in our last re-cap, Christiania had been raided and evacuated by Danish police. Miranda and I left the following morning for London and had to watch from afar for 24 hours. Miranda continued on home to Los Angeles, but I was in London to take care of some business. My first goal was to get a copy of the the catalogue from the Central School of Speech and Drama’s Theatre Material/Material Theatre conference. This was the first time we had appeared anywhere using the name of the Center to talk about what we were working on. It’s a beautiful little volume with great material. That evening was really what I had come for though, the launch event for Arcola’s new space in Dalston. 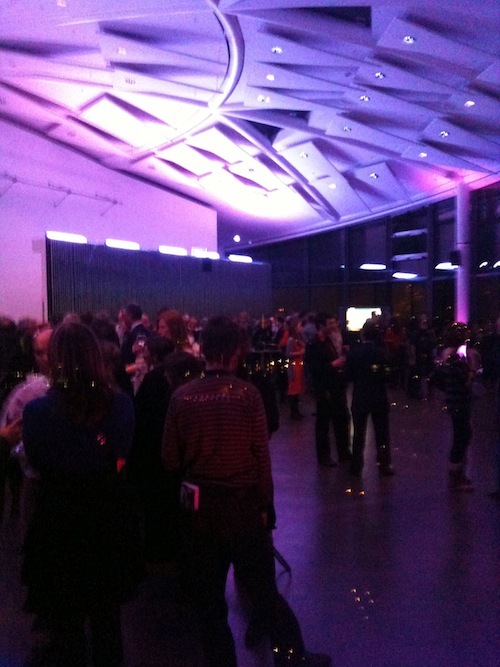 The event was held in London’s Living room on the 9th floor of the London City Hall. Ben Todd appeared, introducing all of he partners in bringing together support behind the project. We’ve got the city of London, ARUP, Hackney, BOC and so on. We celebrated with a couple of drinks and a fantastic view of the tower bridge. The next day was truly the highlight though, I’m only a bit sad that it’s not the right time to got into great detail about what happened. What I can say is that myslef, Ben Todd, and both Peter McKinnon and Liz Asselstine from York University got together in the morning to discuss an ambitious international coalition for sustainability in the performing arts. We followed this meeting by crashing Ben’s next at his invitation. We met with Alison Tickell and Catherine Bottrill of Julie’s Bicycle to discuss both their efforts to green the music industry and how we can all work together. Before heading back to Copenhagen I met, for the first time in person, William Shaw of the RSA for coffee in their London offices. I returned to Copenhagen to a city near lock down. Police are now milling about everwhere. As I’m sure you are likely to know, the demonstrations advancing on the Bella Center on wednesday turned ugly. I hesitate to say violent, but it’s hard not to since police were using force to literally beat back demonstrations. The metro station at the Bella Center is shut down, as are the next in either direction. NGOs have been shut out from the talks, credentials removed and there are a whole lot of angry people as the temperature and snow began to fall. Moving about Thursday brought with it a sense of tension. We’re in the home stretch and at that time we hadn’t had many world leaders appear yet. There is so much work to be done for the climate talks, and so little time, and it’s very cold. Today was my first trip to the Klima Forum, the concurrent meeting for mainly NGOs. Here I was able to interview Aviva Rahmini about her workshop, which I was sad to miss while in London. We were also there for the candle light vigil that evening and a few performances at Øsknehallen. Sara, my host here, and myself met back up and went to the RE:Think – Kakotopia exhibition at the Nikolia Copenhagen Center for Contemporary Art. It’s a good exhibit, one of three locations with a variety of interesting work. You may have seen more about it here before. The work ranges from the witty Safety Gear for Small Animals, to the generative Most Blue Skies, to the strangely fascinating Link. It was in watching Link that we found ourselves sitting next to police that seemed to be taking shifts in from the cold. They were checking their email on iphones and chatting. Wandering around the galleries and looking at the installations. It is very cold outside and we’re right next to the central shopping district and a few steps from the center of the government. But, it’s one thing to walk by police as they patrol, even in heightened numbers. It’s another thing to sit with them in full uniform in a gallery watching this short Finnish film. We walked home, having dinner along the way. 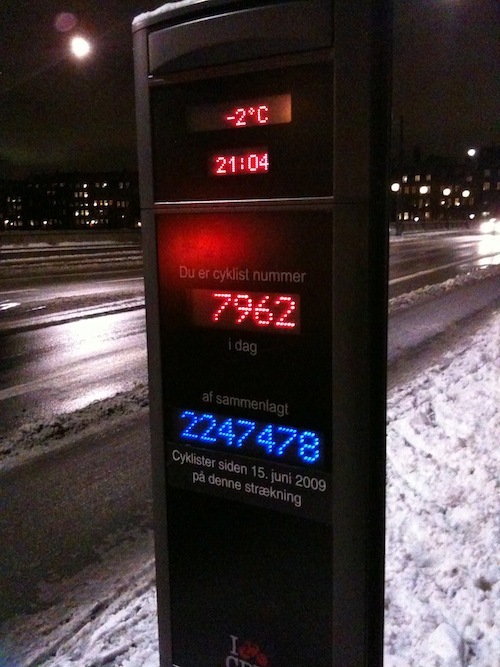 We passed a digital sign post recording the number of bicycles had past that day and since June 15th. There were fireworks, but we don’t know from where. It was hard to tell if it was a dud from the fireworks or something intentional, but we crossed the street at some point after a small explosion went off in front of us. With the about of anger in the air, my mind went to it being something nefarious, but I doubt there is much to that. Today, Friday, the final day, I’m going to meet up with the Wooloo.org guys at their office. I’m going to try and see the final day, and likely the largest and more active of the demonstrations. There is a Yes Men event this evening at the Tck Tck Tck Fresh Air center which I hope to get into. Yes we’re focusing on Art, but for your Information…. Uphill struggle for ambitious deal: The Danish Presidency has given up on its ambition to create consensus on a text that would form the basis of a global political deal to combat global warming, reports a Danish daily. A Bouncer at the Gate: When delegates from Friends of the Earth International turned up today at the Bella Center, site of the climate talks in Copenhagen, to have their badges scanned, they were startled to find they were no longer valid. Forest negotiations are making headway: There is mounting agreement on rewarding tropical countries which slow deforestation under a new deal. This is the first issue where significant progress has been made in Copenhagen. Taking Out the Life Preserver: Yvo De Boer, the chief United Nations functionary managing talks on a new climate treaty, signaled the state of affairs on Tuesday by carrying an orange-and-white life ring with him into the midday news conference. Obama won’t break new ground at summit: A warning to delegates in Copenhagen: If you’re looking for President Barack Obama to cave to pressure and deepen US efforts to curb greenhouse gases, don’t bet on it. Operational accord out of reach, China signals: UN climate conference faces severe difficulties. China signals an operational accord is out of reach. Japan: 15 billion dollars in climate aid: Japanese pledge outbids the EU’s funding for short-term climate aid in developing countries. Kerry: US to pass “major” climate legislation: A successful deal in Copenhagen will lead the way for climate legislation in the US Congress, says Senator John Kerry. China Presses Case for Climate Aid: Even as China has signaled that it won’t be first in line for adaptation assistance from the West, it has remained steadfast in insisting that the language of the one global treaty on climate involving all countries, dating from 1992, still applies. Africa shows a willingness to negotiate: African Union climate negotiator Meles Zenawi has scaled back the demands for climate finance from rich countries, signaling thaw under way in the deadlocked UN negotiations. New compromise proposal said to be on its way: Danish PM takes over the COP15 presidency, he will present a compromise on Wednesday afternoon, a Danish newspaper reports. Alternative conference venue for observer organizations TV links and wireless internet connections have been provided for NGOs and others who are barred from entering the Bella Center Thursday and Friday due to access restrictions. Key issues at Copenhagen climate talks: The Associated Press has taken a look at key sticking points during negotiations at the UN climate summit in Copenhagen. Countries pledge billions to protect rainforests: The US, Australia, France, Japan, Norway and Britain will make 3.5 billion US dollars available for developing countries that produce ambitious plans to slow and eventually reverse deforestation. The Missing ‘P’ Word in Climate Talks: If you scan the most recent drafts of the climate agreement that delegates here are trying to complete, you’ll have a hard time finding the word population. Climate talks deadlocked as clashes erupt outside: Danish police fired pepper spray outside the UN climate conference on Wednesday, as disputes inside left major issues unresolved just two days before world leaders hope to sign a historic agreement to fight global warming. De Boer: “Unexpected stop” in negotiations: “A number of unsolved issues” are left for world leaders to resolve during the next two days, said the UNFCCC Executive Secretary, after observers of the UN climate conference had spent Wednesday afternoon waiting for breaking news on the climate talks. India: Kyoto in intensive care if not dead: Whether the expiring Kyoto Protocol, which sets targets for greenhouse gas emissions from rich countries only, should be continued, expanded or replaced with an alternative agreement still splits the parties. COP15 among the largest summits ever: The 119 heads of state and government participating at the climate summit in Copenhagen represent countries that account for 89 percent of the world’s GDP. British PM warns of failure but brings hope: According to British Prime Minister Gordon Brown, the first sign of progress in the negotiations could be seen Wednesday with new proposals for climate change from African Union climate negotiator Meles Zenawi. Carbon capture is put on hold: As some countries have reservations on carbon capture and storage (CCS) the emerging technology is not likely to be added to the UN-backed carbon reducing mechanisms here in Copenhagen. UN conference gearing up for make-or-break finale: World leaders “face a defining moment in history”, UN Secretary-General Ban Ki-moon said as the Copenhagen conference formally entered its high-level stage Tuesday. Developing world threatens battle on drafts: African countries, Brazil, China, South Africa and India say they have produced a default proposal to be used only if rich countries try to shortcut UN-led negotiations in Copenhagen. Poll: Action on climate will boost US economy: More Americans believe steps taken to reduce global warming pollution will help the US economy than say such measures will hurt it. South Korea to bridge rich and poor nations: As the first emerging economy to take on absolute reduction commitments, South Korea hopes to play a key role in Copenhagen where on Thursday President Lee Myung-bak will also offer to host the 2012 UN conference on climate change. Merkel concerned over Copenhagen pace: German Chancellor Angela Merkel voiced concern Tuesday about the pace of climate negotiations in Copenhagen and said she is “somewhat nervous” about prospects of success. Must-See Video of Youth in Copenhagen: Blame Canada! Crackdown in Copenhagen:You can help by signing this petition protesting Danish police violence against climate protestors. HEADQUARTERS, a collaboration venue for artists and climate activist groups in Copenhagen, invites you to come play “GOOD COP”. With civil society access to Bella Center growing increasingly restricted, the GOOD COP aims to make your voice heard during this critical week of negotiations. GOOD COP opens following a bold media stunt on Monday by North American, European and African activists that placed the spotlight on countries standing in the way of a real deal in Copenhagen. The stunt – and the global attention that followed – challenged us to imagine the world as we want it, and proved that our alternative messages can and will have an impact. But this was only one statement of the many that need to be voiced in the final days of negotiations. HEADQUARTERS welcomes the public to come voice their own statements on the GOOD COP stage. As heads of state arrive this week we need to keep our expectations high to push for our vision of a GOOD COPENHAGEN – a real deal at COP15. Have your say at GOOD COP – show that an ambitious agreement at COP15 is not too good to be true. Frederiksholms Kanal 4, st. th. GOOD COP15 United Nations Climate Change Conference Copenhagen 2009.